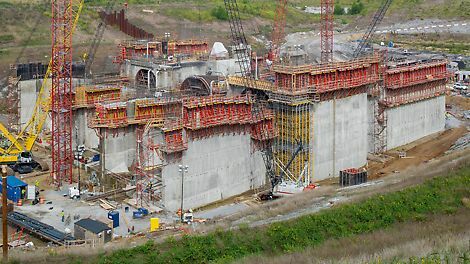 As a manufacturer and supplier of Formwork, Shoring and Scaffolding Systems, we understand that contractors need systems that save labor time, ensure safety on site and deliver excellent results. Our wide range of products allows you to choose the most cost-effective and efficient solution. Whether you need a lightweight system for small residential projects with limited crane capacity or require heavy duty systems for the construction of massive bridges, dams and power plants - we have the solution. 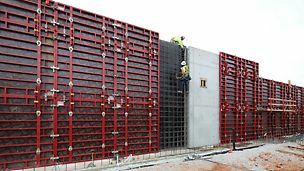 Formwork provides a temporary "shell" to freshly poured concrete, allowing it to cure until it can support itself. More often than not, the labor hours - setting up the forms - are the mostly costly part of a concrete project. That's why PERI systems are among the most labor efficient systems in the world, while at the same time ensuring maximum flexibility and the highest quality concrete finishes. 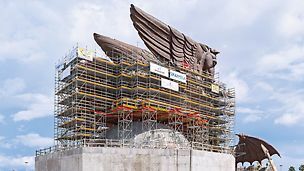 Scaffolding systems provide temporary access to building facades, industrial structures and other areas. Our PERI UP Flex modular scaffolding system goes up faster than any other system while at the same time fulfilling highest safety standards. 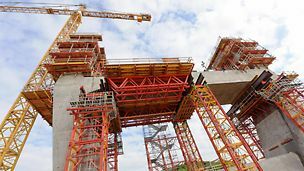 From light weight aluminum props supporting slab tables to heavy duty shoring towers supporting large-span bridge beams - we have the right products and custom solutions for every project requirement.